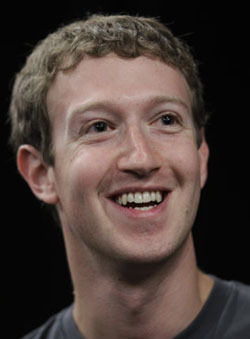 Tomorrow on ABC News Mark Zuckerberg will be revealing a new Facebook feature that has “the power to save lives”. How delightfully exciting and cryptic. But what could it possibly be? The interwebz is crazily speculating about what Facebook founder Mark Zuckerberg and COO Sheryl Sandberg might be revealing on ABC News tomorrow. The only facts we have so far are that it’ll be a big deal and it’ll be about a new “tool” which will have “the power to save lives”. We know, we know, it sounds like a line from Lord of The Rings. Now the rational and logical side of Shiny Shiny (yes, there is one) would bet on the new tool being about reporting emergencies (like the suicide lifeline) or crimes, security or privacy. Yes, we realise that’s rather vague but we’ve hardly got much to go on here, have we? However, the side that worships at the altar of Boo the dog and sloth videos wants it to be much more fantastical. Maybe you can press a special button and Zuckerberg comes to the rescue dressed as ‘Facebook Boy’. He’d look hot in spandex, right? Or maybe you have a chance to win the singing Cosmic Key from the He-Man movie, because that had the power to save lives. Or kill people. We’re not sure. What will Facebook’s new feature be all about?